Wages are said to be flexible when they respond to changes in supply and demand and lead to the market clearing wage being set. 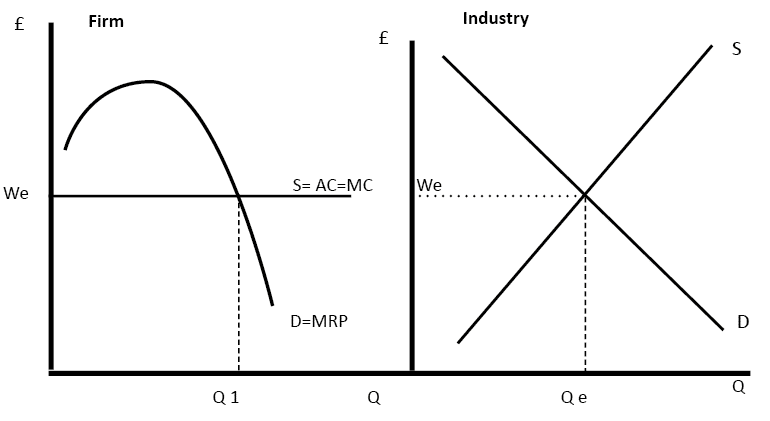 It implies that the wage will be set by the Marginal Revenue Product of labour and marginal cost of labour. Any change in supply and demand for labour will lead to a change in the wage rate. 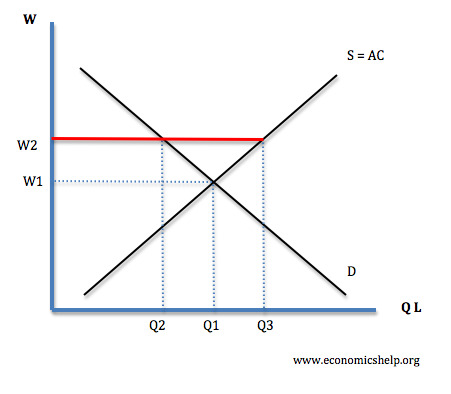 With perfectly flexible wages, the wage rate would always be set where MRP of labour = Marginal Cost (MC) at Q1. Therefore, if a workers, marginal product increased, this would translate into a higher wage rate. This could be achieved by paying workers piecemeal for the amount they produce, e.g. £3 per cartoon of broccoli that you pick. If there was an increase in the supply of workers in the industry, this would push down wages in the industry, leading to an immediate decline in the wage of each worker. Usually, this wouldn’t happen because workers would resist nominal wage cuts, and firms may even be reluctant to cut wages because of impact on morale/costs of changing wages. Under some circumstances, wages can be sticky downwards. This means trades unions are able to prevent wages falling to the market clearing level. This can lead to classical unemployment with wages above the equilibrium. Wages do not change very frequently. But, only at certain time periods. If wages are, initially W2. Then if wages are flexible, wages should fall to W1. The flexibility of wages depends on the relations of labour and organised business. If unions are strong and powerful, wages are less likely to be flexible and wages could be maintained at W2 – this would be an inflexible wage. 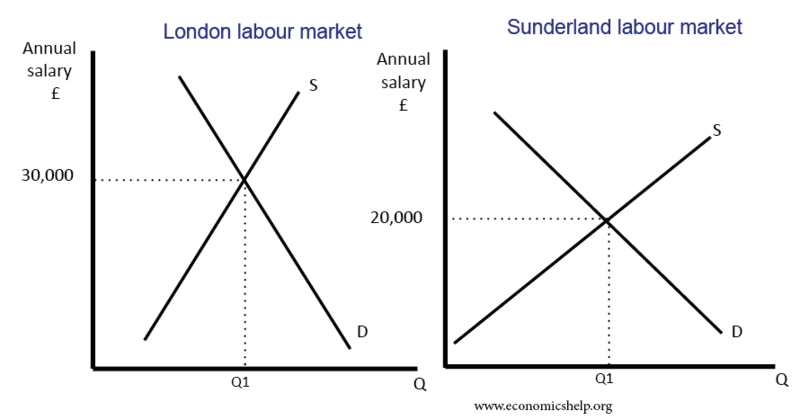 In this case, wages in London are higher than wages in Sunderland. This is because of different local economies and geographical immobilities. Firms in London are more profitable and so can pay higher wages, but with more expensive housing costs, the supply of labour is more limited. This causes wages to be higher.